I have no idea where my St. Patrick's day decorations went. They either got lost in the move or are hiding someplace really weird. 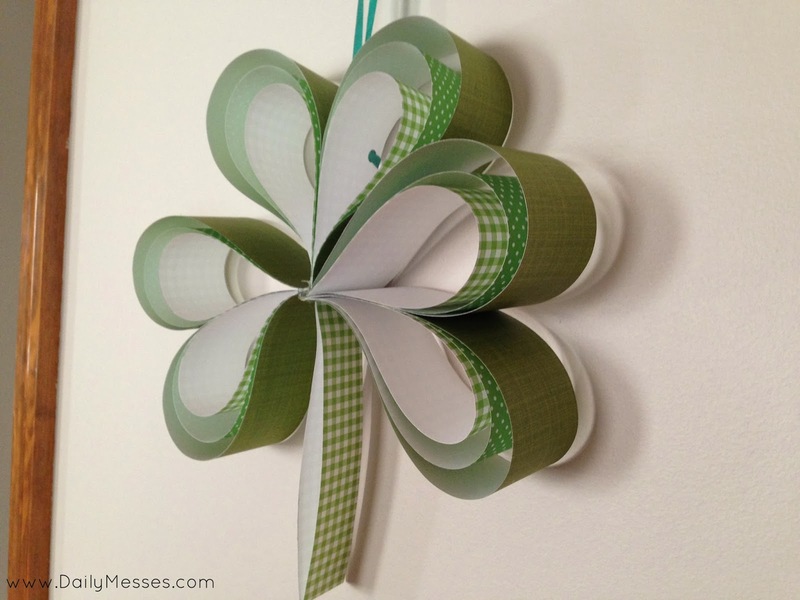 I wanted to have something up for decoration, so we made paper shamrocks. They were really easy to make! You could make a garland of small ones, hang larger ones on the wall or front door, or even from the ceiling. 5. Gather the strips together in this order: small/medium/large/large/medium/small, so that the longest are in the middle and smallest on outside. If you have paper that is only colorful on one side like I did, make sure the colorful side is facing inward. 6. Make sure the bottoms are even and staple together (or you can hold in place too). 7. Fold over the strips one at a time, working smallest to longest to form a heart shape. 8. Line up ends of paper so they are even and staple together. 9. Make two more hearts to form the three leaves of the shamrock. 10. Hot glue the three points of the hearts together and slide in the stem. 11. Hold in place until set.